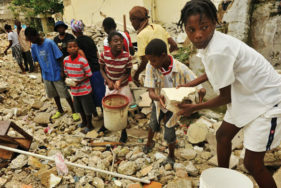 ATD Fourth World has been working in one of the most underprivileged areas of Port-au-Prince for over 25 years. 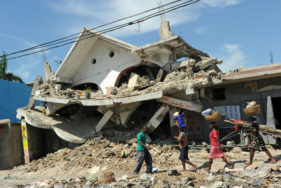 Our team consists of 11 Volunteer Corps members, eight of whom are Haitian. Our work in Haiti seeks to give those living in extreme poverty the ability to access medical care, to educate their children, to meet, and to speak out. Our projects aim to give the families we work with the ability to overcome daily emergencies, and to develop long term projects. Our projects with small children include Bébés Bienvenus (“Babies Welcome”), gatherings for children under three years of age and their parents, seeking to encourage the nutrition, health, and education of small children. Graines d’Espoir (“Seeds of Hope”), welcomes children from four to six years old to help prepare them for beginning primary school. 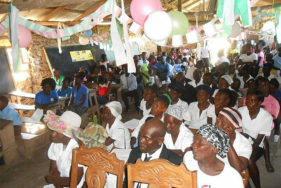 Our health projects include a collaboration with a Haitian NGO, Service Œcuménique d’Entraide (SOE), to guarantee access to healthcare for the most vulnerable families through a micro-insurance system. Our education and training projects include a Street Library run in partnership with LAKOU Don Bosco, focused on boys who live on the streets. A computer workshop works with unemployed young people aged 18 to 30 who don’t have training. Knowledge sharing projects during school vacations bring together young people and artists. A reading group meets with university students to discuss questions relating to extreme poverty. The Comite de rassemblement Quart Monde meets once a month to discuss questions relating to our team’s work and lives. Larger gatherings take place related to events like the 2010 earthquake or the research on the MDGs.